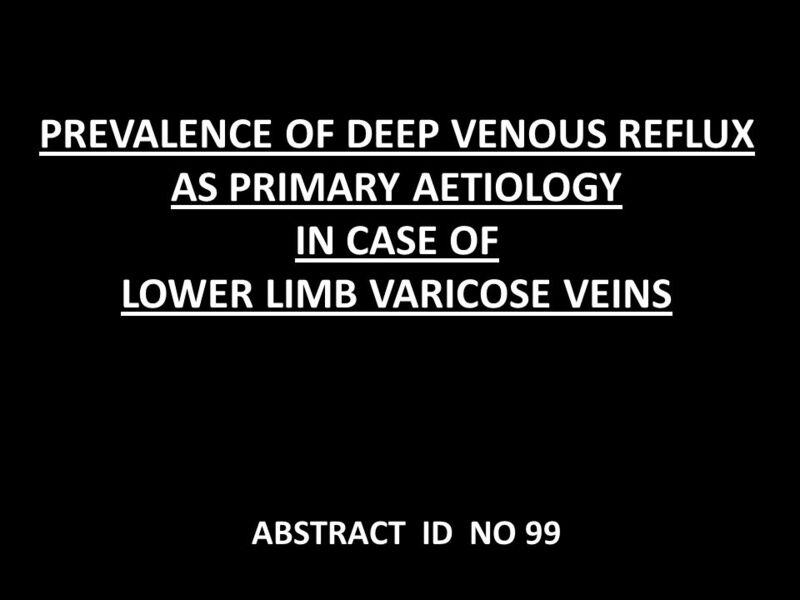 PREVALENCE OF DEEP VENOUS REFLUX AS PRIMARY AETIOLOGY IN CASE OF LOWER LIMB VARICOSE VEINS ABSTRACT ID NO 99. 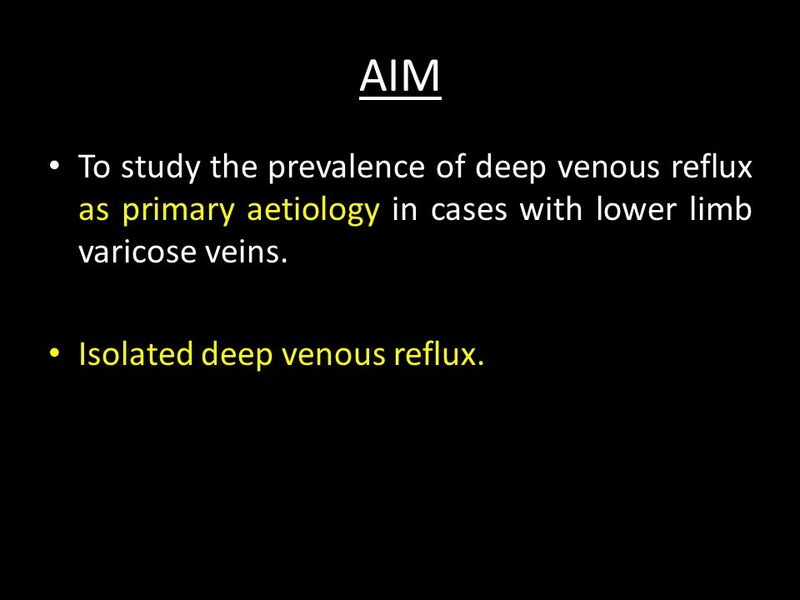 3 AIM To study the prevalence of deep venous reflux as primary aetiology in cases with lower limb varicose veins. 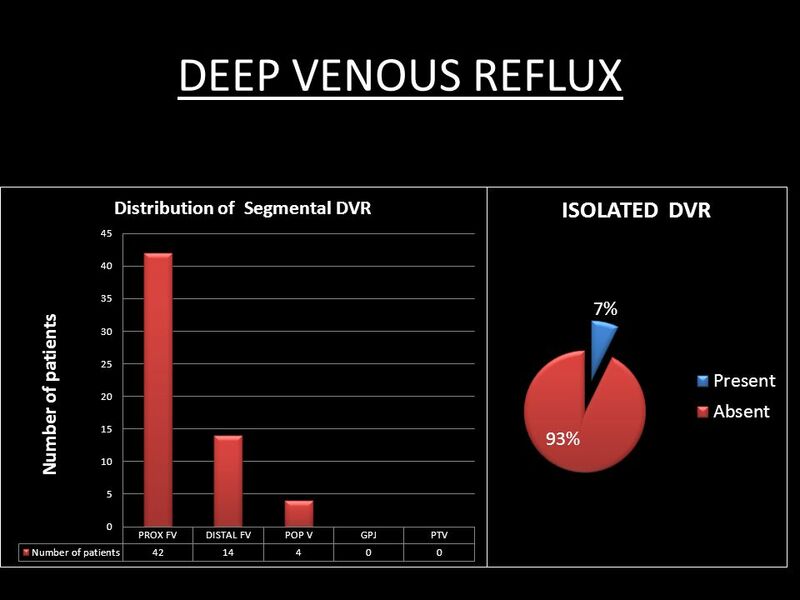 Isolated deep venous reflux. 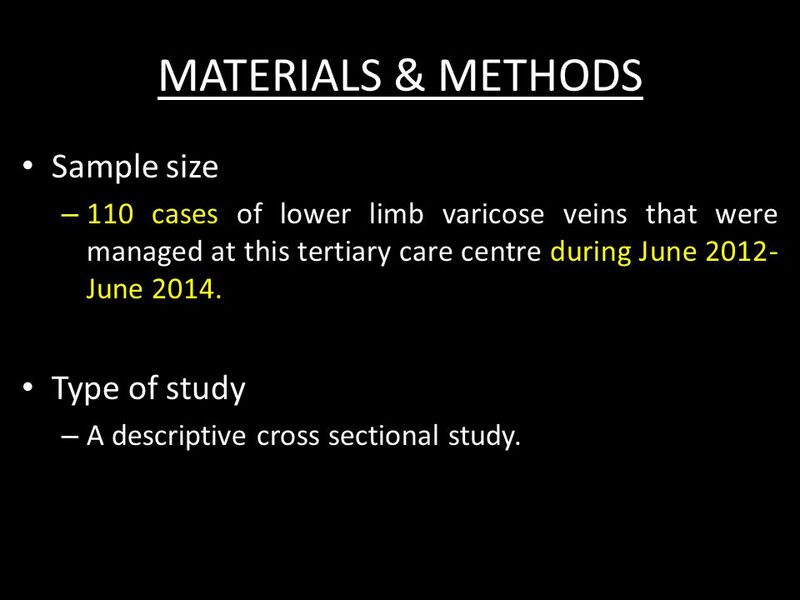 5 MATERIALS & METHODS Sample size – 110 cases of lower limb varicose veins that were managed at this tertiary care centre during June 2012- June 2014. Type of study – A descriptive cross sectional study. 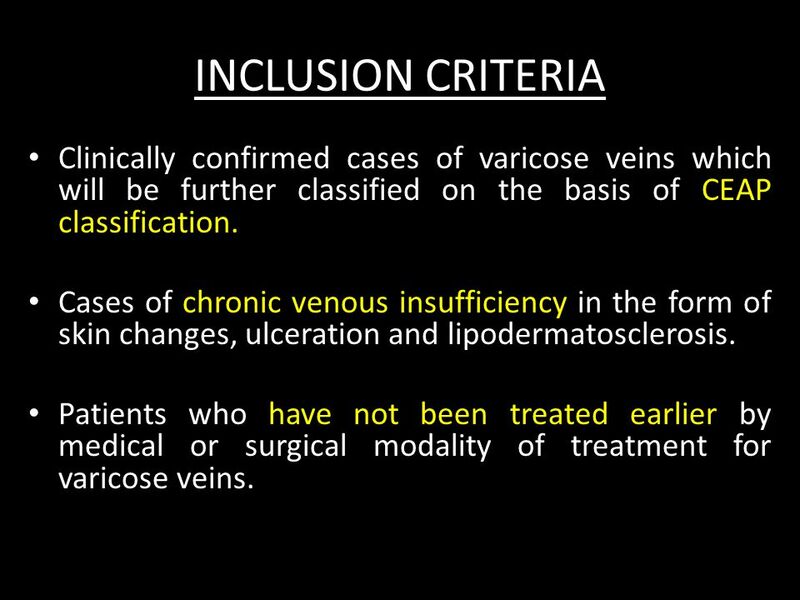 6 INCLUSION CRITERIA Clinically confirmed cases of varicose veins which will be further classified on the basis of CEAP classification. Cases of chronic venous insufficiency in the form of skin changes, ulceration and lipodermatosclerosis. Patients who have not been treated earlier by medical or surgical modality of treatment for varicose veins. 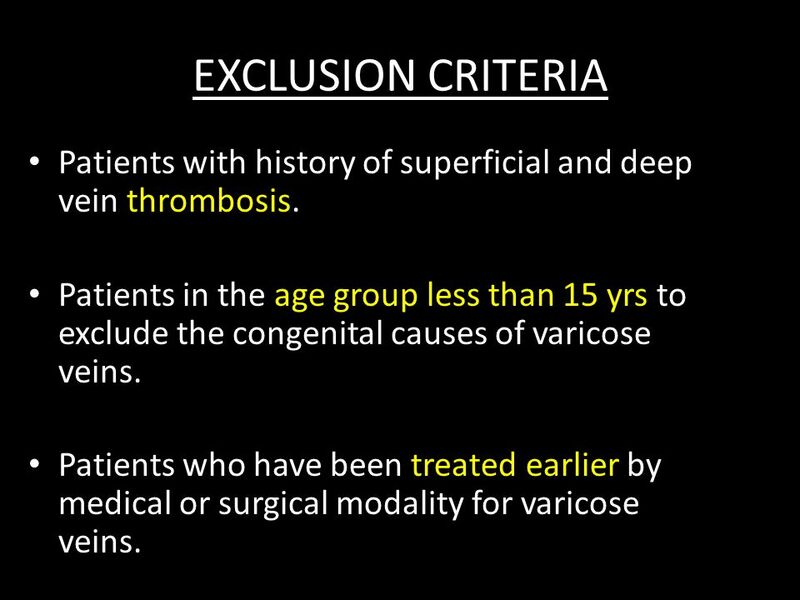 7 EXCLUSION CRITERIA Patients with history of superficial and deep vein thrombosis. Patients in the age group less than 15 yrs to exclude the congenital causes of varicose veins. Patients who have been treated earlier by medical or surgical modality for varicose veins. 8 DOPPLER EXAMINATION Patients were examined in standing position. 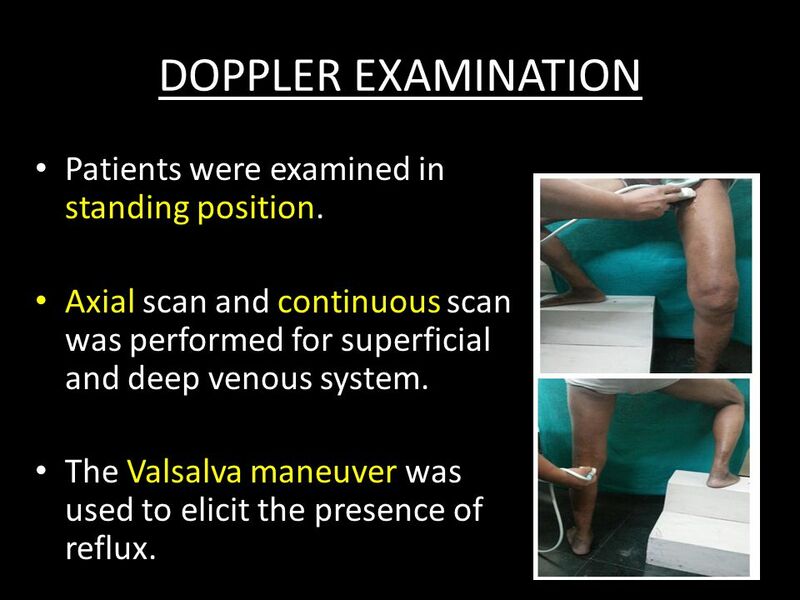 Axial scan and continuous scan was performed for superficial and deep venous system. The Valsalva maneuver was used to elicit the presence of reflux. 9 DEFINITION OF SIGNIFICANT REFLUX More than 500 msec – Superficial veins. – Deep femoral veins. – Femoro-popliteal veins. – Deep calf veins. More than 350 msec – Perforators. 20 DISCUSSION Irodi et al. – 12 % patients in C3 grade. – 43% patients in C4 grade. – 11 % patients in C5 grade. – 34% patients in C6 grade. Mercer – Study on 89 cases of lower limbs. 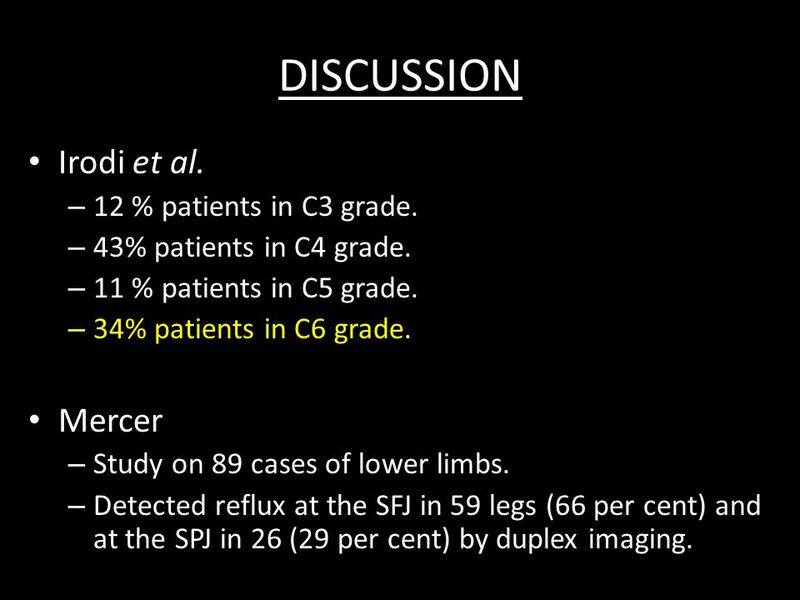 – Detected reflux at the SFJ in 59 legs (66 per cent) and at the SPJ in 26 (29 per cent) by duplex imaging. 21 DISCUSSION Myers et al. 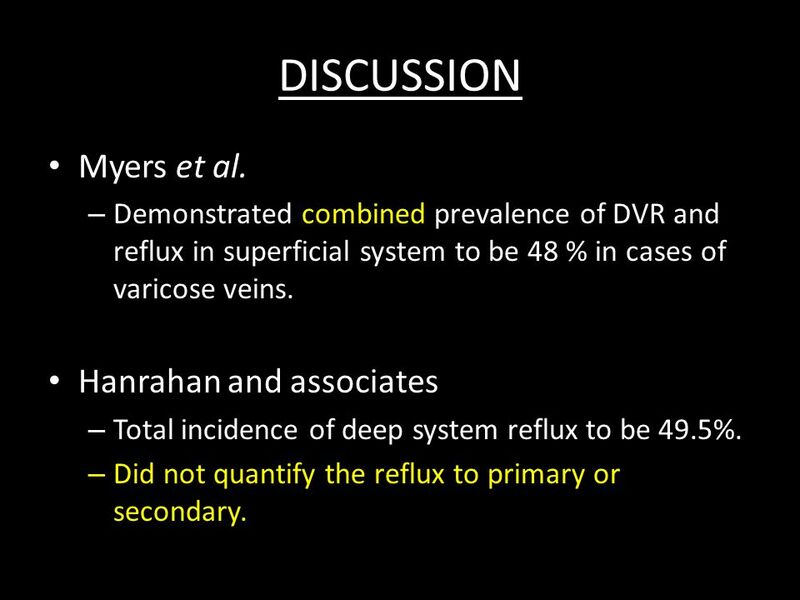 – Demonstrated combined prevalence of DVR and reflux in superficial system to be 48 % in cases of varicose veins. Hanrahan and associates – Total incidence of deep system reflux to be 49.5%. – Did not quantify the reflux to primary or secondary. 23 DISCUSSION Joh & Park – used recumbent patient position. 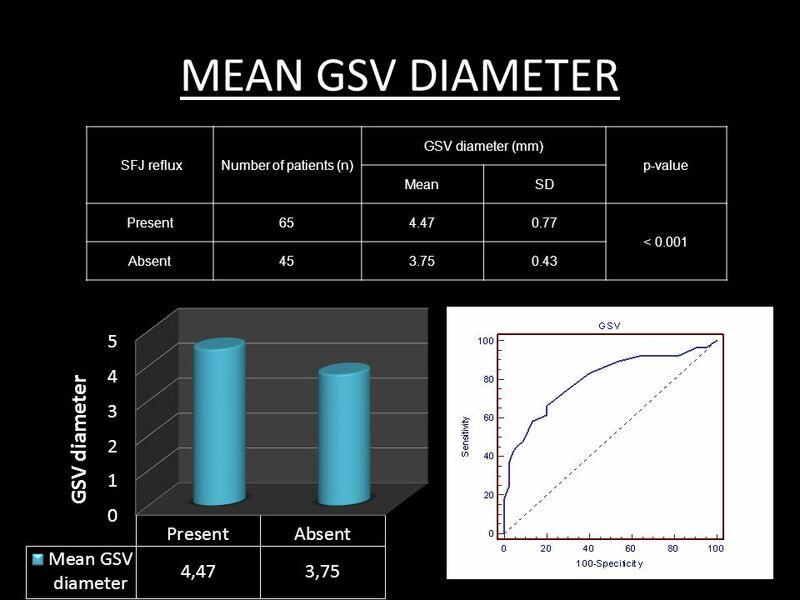 – The mean diameter of a GSV with reflux was 6.4 ± 2.0 mm. – Normal GSV mean diameter measured 5.0 ± 2.4 mm. 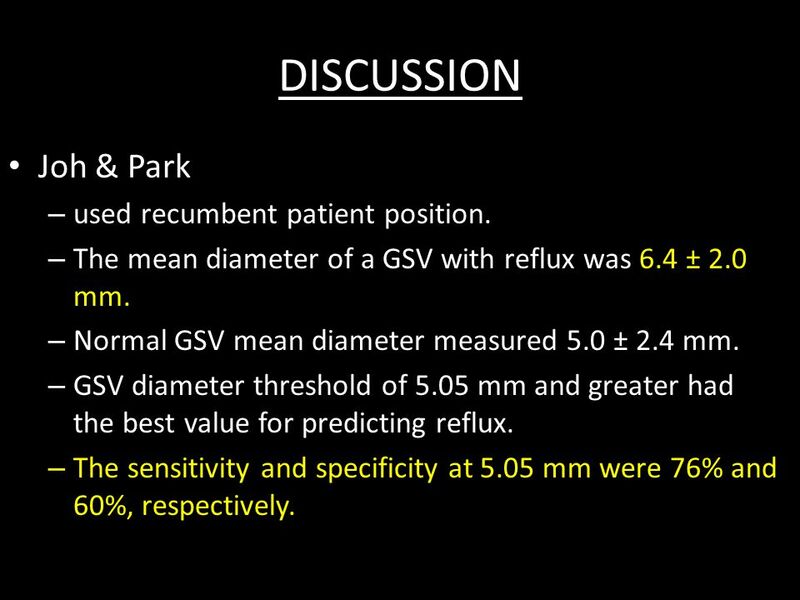 – GSV diameter threshold of 5.05 mm and greater had the best value for predicting reflux. – The sensitivity and specificity at 5.05 mm were 76% and 60%, respectively. 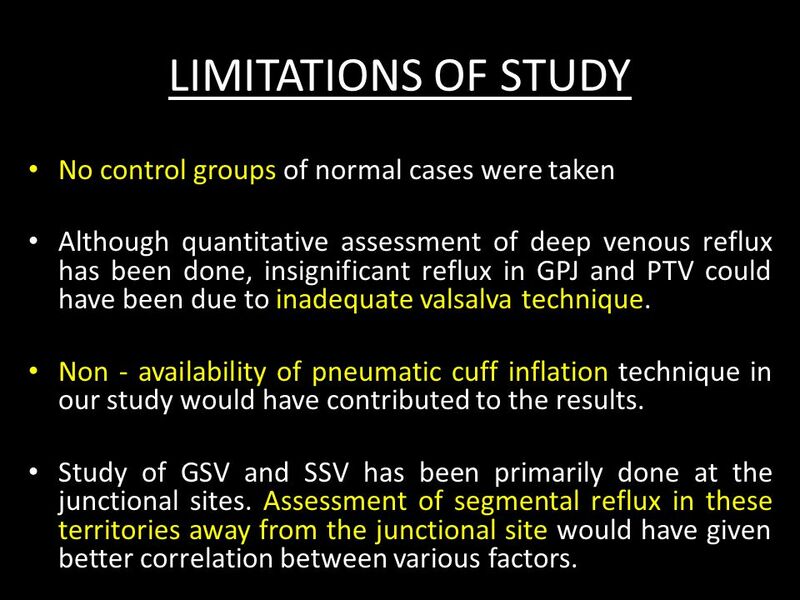 24 LIMITATIONS OF STUDY No control groups of normal cases were taken Although quantitative assessment of deep venous reflux has been done, insignificant reflux in GPJ and PTV could have been due to inadequate valsalva technique. Non - availability of pneumatic cuff inflation technique in our study would have contributed to the results. Study of GSV and SSV has been primarily done at the junctional sites. Assessment of segmental reflux in these territories away from the junctional site would have given better correlation between various factors. 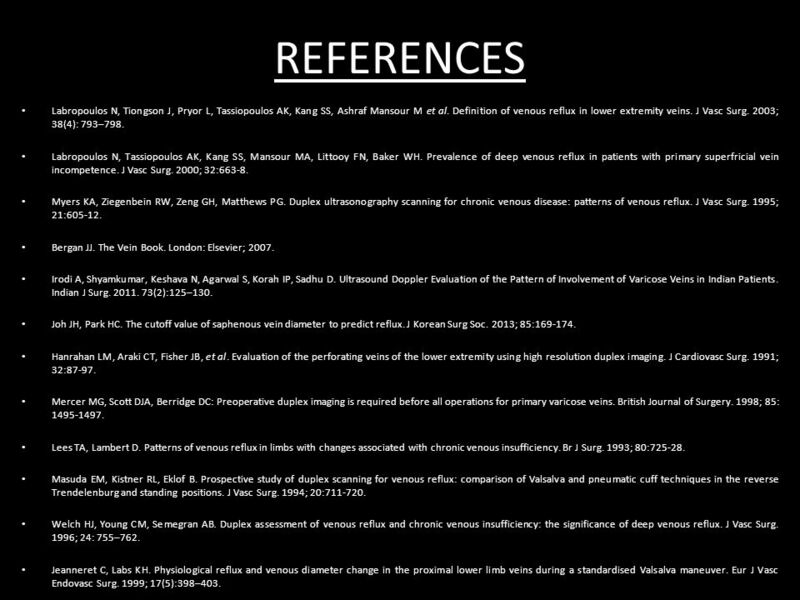 25 REFERENCES Labropoulos N, Tiongson J, Pryor L, Tassiopoulos AK, Kang SS, Ashraf Mansour M et al. 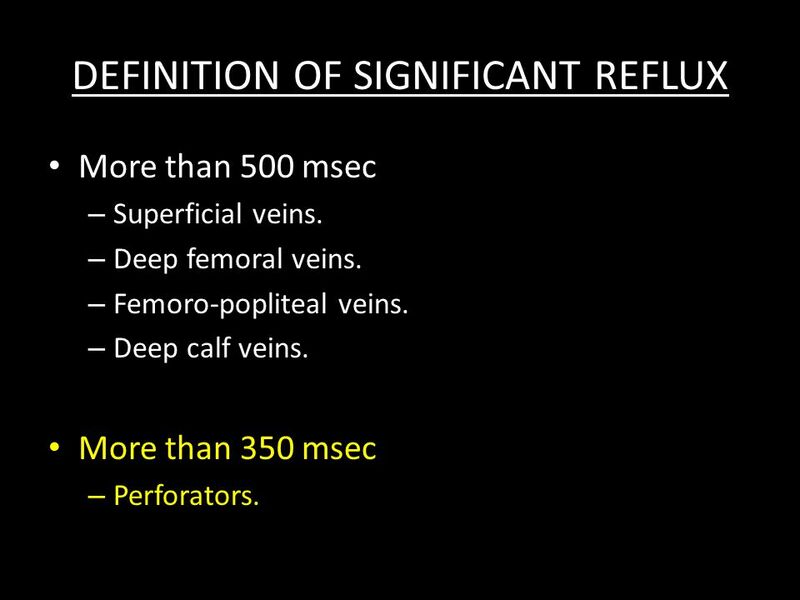 Definition of venous reflux in lower extremity veins. J Vasc Surg. 2003; 38(4): 793–798. Labropoulos N, Tassiopoulos AK, Kang SS, Mansour MA, Littooy FN, Baker WH. 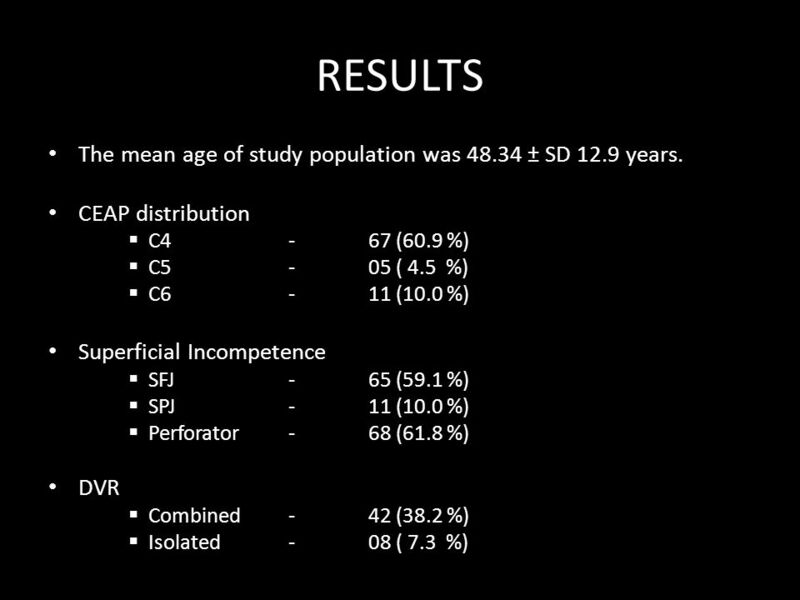 Prevalence of deep venous reflux in patients with primary superfricial vein incompetence. J Vasc Surg. 2000; 32:663-8. Myers KA, Ziegenbein RW, Zeng GH, Matthews PG. 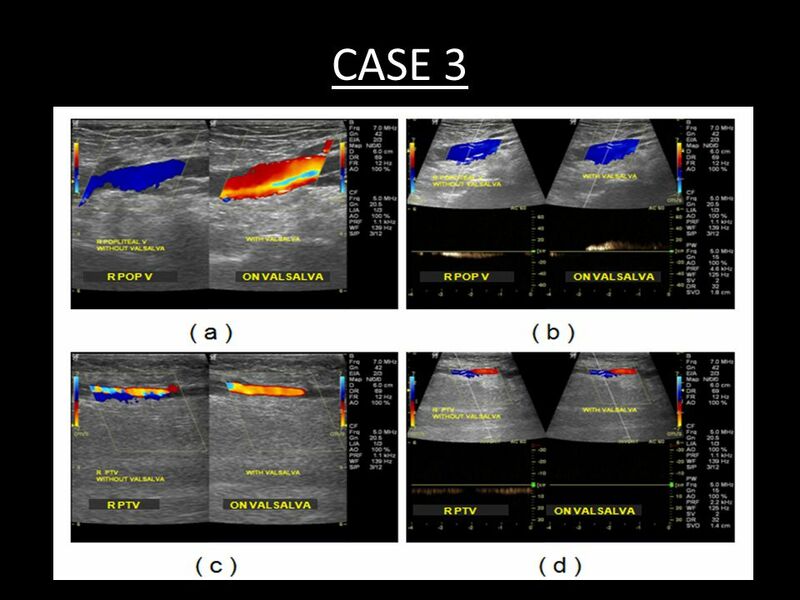 Duplex ultrasonography scanning for chronic venous disease: patterns of venous reflux. J Vasc Surg. 1995; 21:605-12. Bergan JJ. The Vein Book. London: Elsevier; 2007. 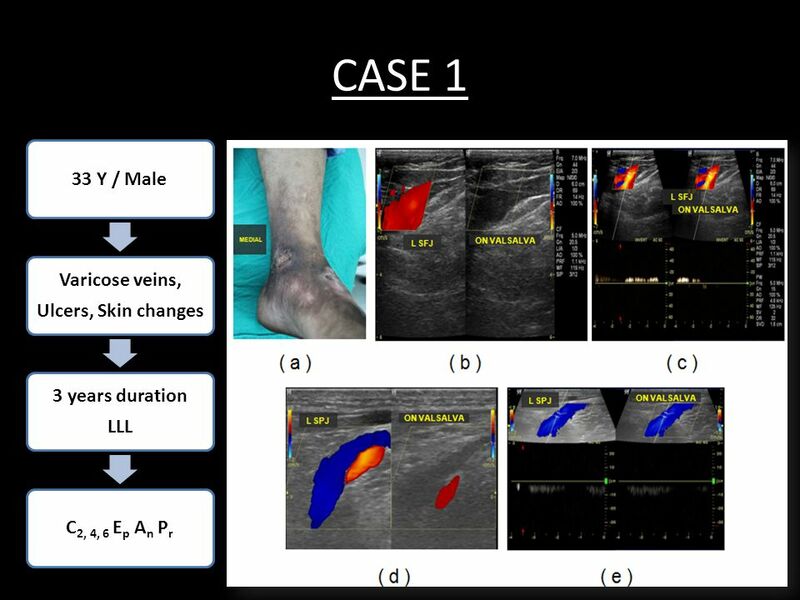 Irodi A, Shyamkumar, Keshava N, Agarwal S, Korah IP, Sadhu D. Ultrasound Doppler Evaluation of the Pattern of Involvement of Varicose Veins in Indian Patients. Indian J Surg. 2011. 73(2):125–130. Joh JH, Park HC. 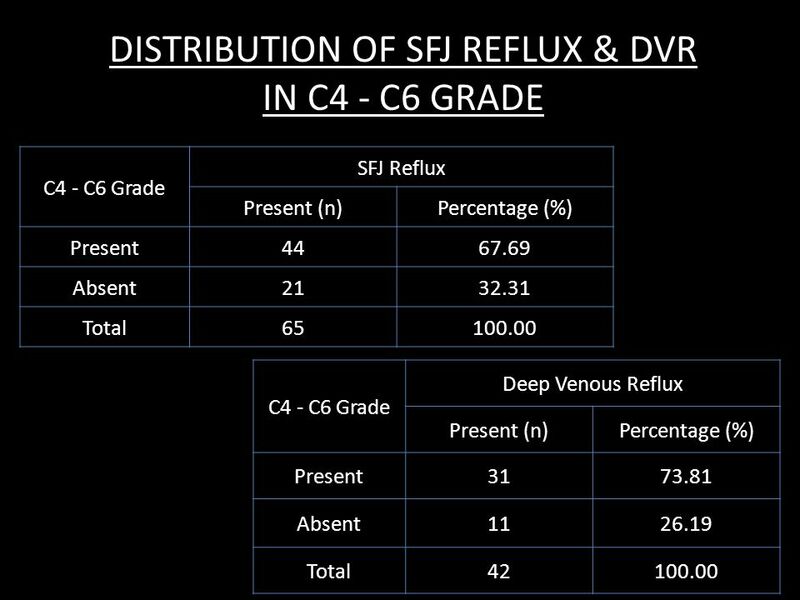 The cutoff value of saphenous vein diameter to predict reflux. J Korean Surg Soc. 2013; 85:169-174. 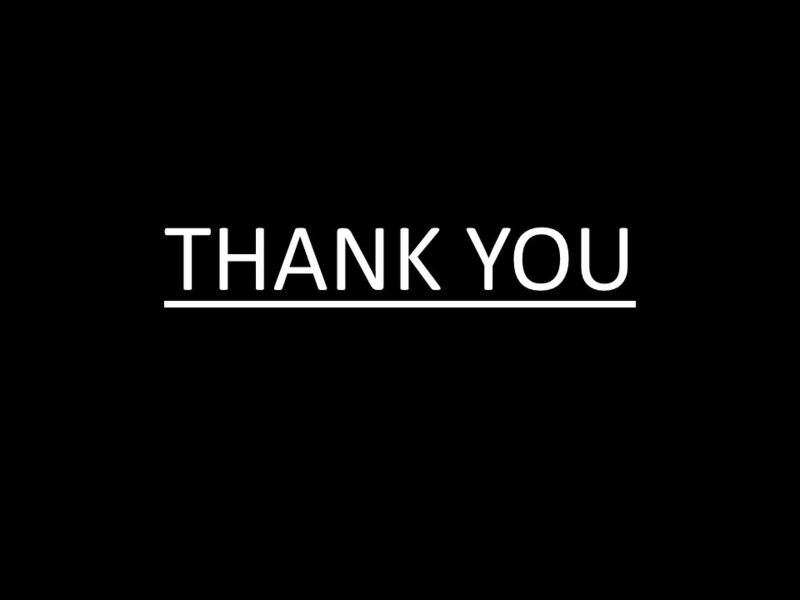 Hanrahan LM, Araki CT, Fisher JB, et al. 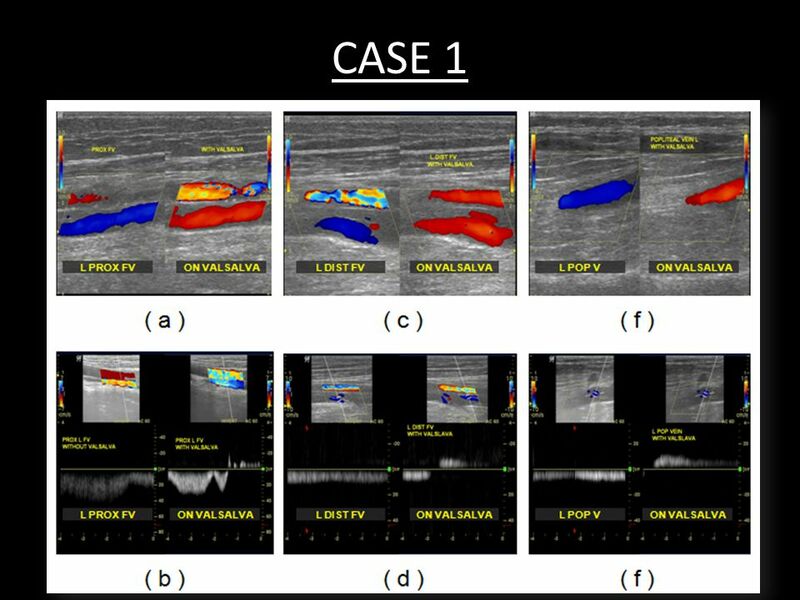 Evaluation of the perforating veins of the lower extremity using high resolution duplex imaging. J Cardiovasc Surg. 1991; 32:87-97. 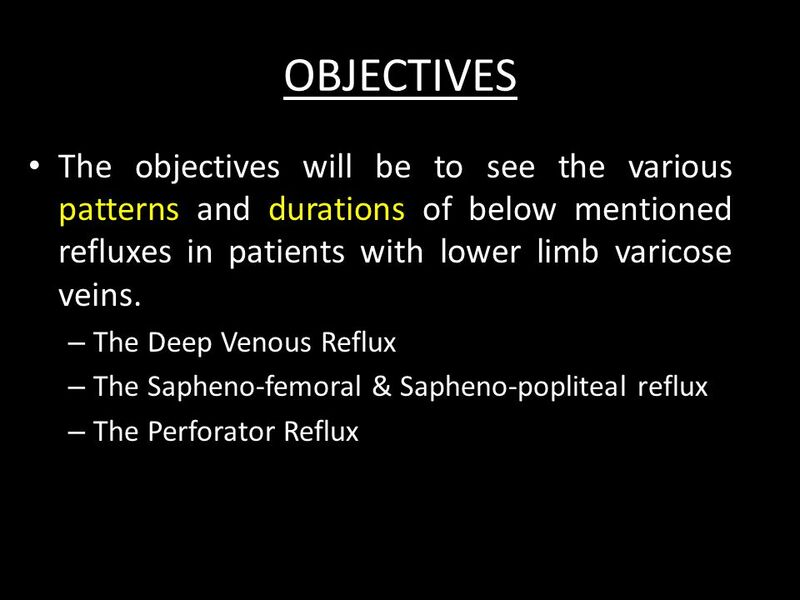 Mercer MG, Scott DJA, Berridge DC: Preoperative duplex imaging is required before all operations for primary varicose veins. British Journal of Surgery. 1998; 85: 1495-1497. Lees TA, Lambert D. Patterns of venous reflux in limbs with changes associated with chronic venous insufficiency. Br J Surg. 1993; 80:725-28. Masuda EM, Kistner RL, Eklof B. Prospective study of duplex scanning for venous reflux: comparison of Valsalva and pneumatic cuff techniques in the reverse Trendelenburg and standing positions. J Vasc Surg. 1994; 20:711-720. Welch HJ, Young CM, Semegran AB. 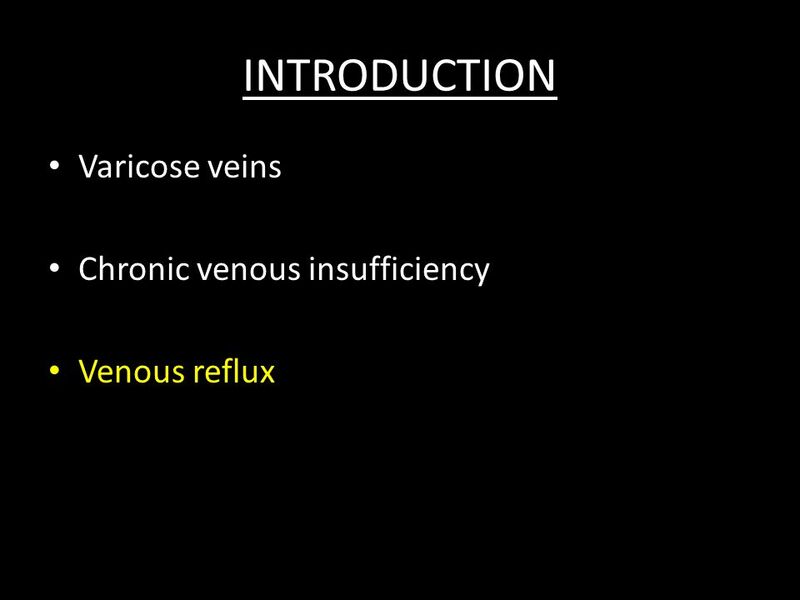 Duplex assessment of venous reflux and chronic venous insufficiency: the significance of deep venous reflux. J Vasc Surg. 1996; 24: 755–762. Jeanneret C, Labs KH. 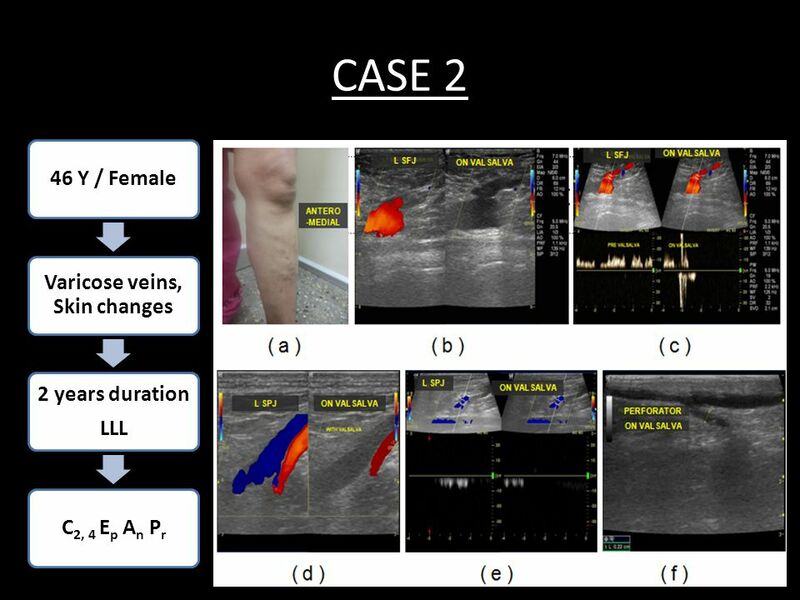 Physiological reflux and venous diameter change in the proximal lower limb veins during a standardised Valsalva maneuver. Eur J Vasc Endovasc Surg. 1999; 17(5):398–403. 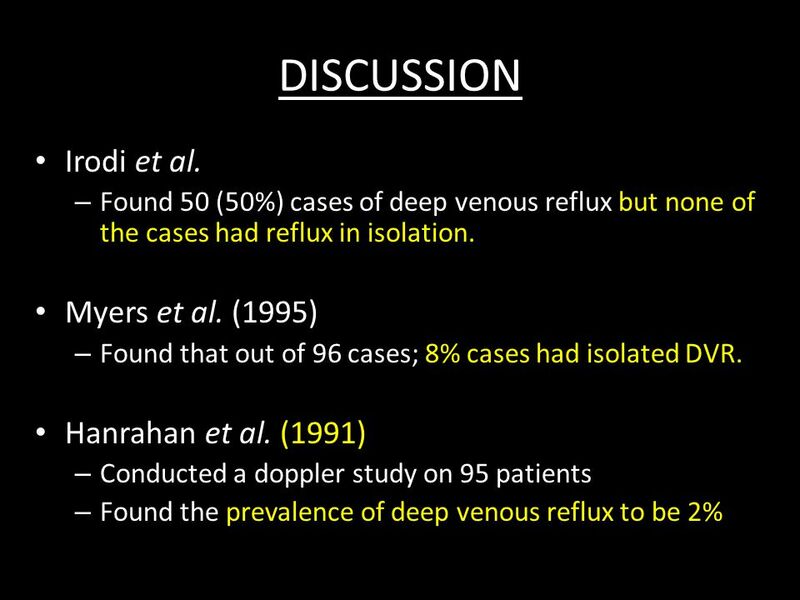 Download ppt "PREVALENCE OF DEEP VENOUS REFLUX AS PRIMARY AETIOLOGY IN CASE OF LOWER LIMB VARICOSE VEINS ABSTRACT ID NO 99." Setting: United Kingdom (Leeds) Target Population/Sample: Non-randomized sample of 95 patients (104 limbs) attending the venous clinic at the General Infirmary. Case Study: Venous Ulceration in Combination with Calciphylaxis Ron Bush, MD, FACS Midwest Vein & Laser Center Dayton, Ohio. Clinical Significance of Preoperative 18F-FDG PET Non- Avidity in Papillary Thyroid Carcinoma Do Hoon Koo 1, Ho-Young Lee 2, Kyu Eun Lee 3,4, So Won Oh. 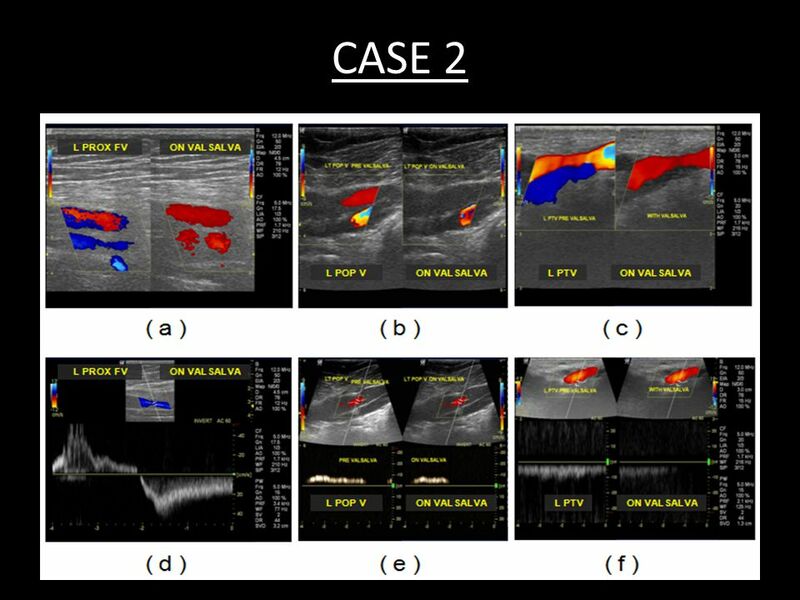 Does competence of the terminal and/or pre-terminal valve influence the modalities of foam sclerotherapy for the treatment of trunk varices ? By Claudine. Complicated Superficial Venous Disease Ron Bush, MD, FACS Midwest Vein & Laser Center Dayton, OH. Detecting Pelvic Disease With Duplex Ultrasound Ron Bush, MD, FACS Midwest Vein & Laser Center Dayton, Ohio. VARICI RECIDIVE DAL 6% ALL`80% ? REZIDIVVARICOSIS von 6% bis 80% ? RECURRENT VARICOSE VEINS FROM 6% TO 80% ? Ebner H*, JA Ebner** * SVGTCHIR, ** CHIRURGIA. Bringing venous hemodynamic testing to you. Understanding venous physiology Pneumatic Venous Plethysmography. DVT with ankle fractures: Is thromboprophylaxis warranted? Sunit Patil Jamshid Gandhi Ian Curzon Anthony Hui James Cook University Hospital, Middlesbrough. Varicose Veins Core Surgical Trainees Vascular Teaching Day Kent and Canterbury Hospital 1st December 2009 Hasantha Thambawita SpR Vascular Surgery. 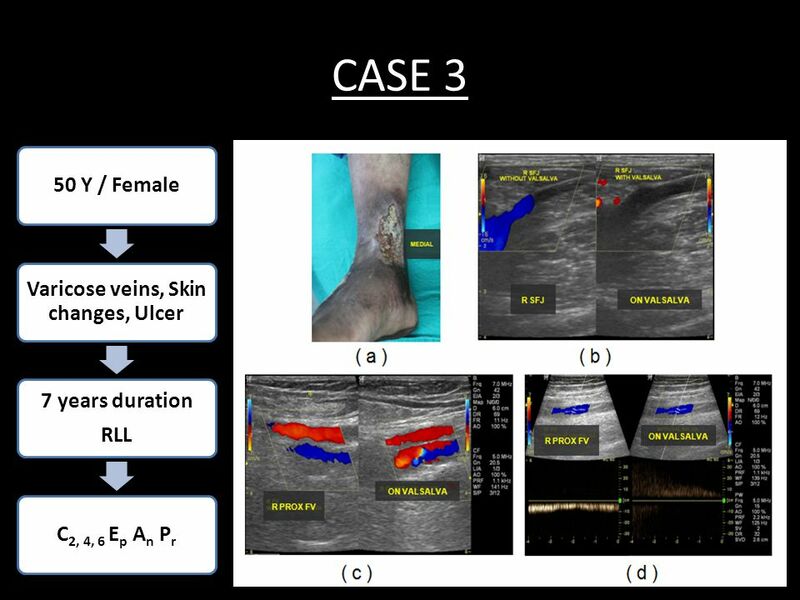 Endoluminal radiofrequency ablation and Endovenous laser therapy for the treatment of Varicose Veins: techniques and outcomes.